What’s for breakfast – Biscuits? Tamales? Here in the Carolinas, lots of country gas stations serve biscuits with a slice of ham or a hunk of sausage, a quick breakfast for working folk. At Poplar Tent Marathon, on Poplar Tent Road just off I85, next to the biscuits you’ll now find hot tamales. Anselmo “Chemo” Bustos came to the U.S. eleven years ago from tiny Tamacuaro in the state of Guerrero, Mexico, following a brother who labored in Carolina tobacco fields. Chemo found his way to this gas station as kitchen help and worked up to become manager. Along the way he married Lurdes, a girl from La Palma, not far from Tamacuaro. He saw her on a friend’s home video of a village fiesta. “Two months later was our wedding,” he says happily. 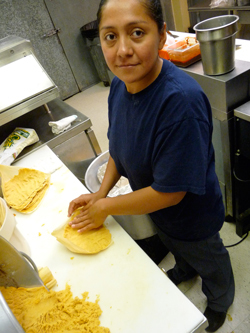 Today Lurdes makes tamales fresh each day, just as she did in the mountains of Mexico. Masa – corn meal dough – is patted into a corn husk wrapper. Cooked pork or chicken and homemade salsa are spread on. Then it’s all folded into a neat, hand-sized bundle and steamed for three hours. Peal away the husk and warm goodness melts in your mouth. And Lurdes now prepares breakfast biscuits, honoring the traditions of her adopted land. She fills them with sausage, eggs, ham – not sweet deli ham, but the tangy country ham that’s a Carolina favorite. In this New South, old tastes co-exist alongside new arrivals.